My win 10 is set to start screen saver after 2 mins and put monitor to turn off monitor after 15 mins. Password is required on resume from screen saver. But the result I get if ignoring computer for 15 minutes or more, the password is never required at all. How do I fix this windows issue? 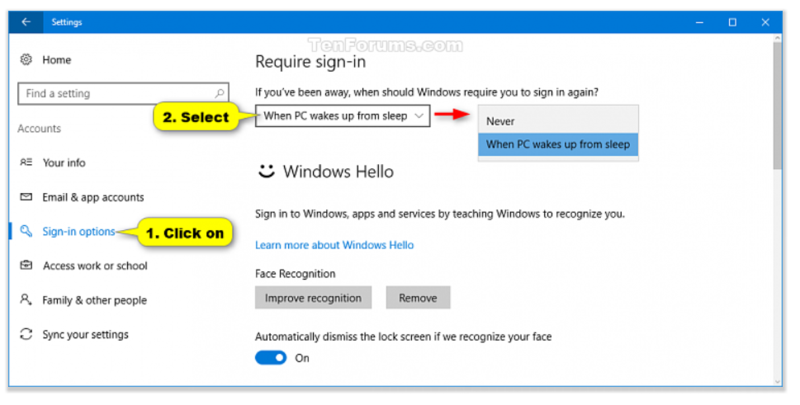 Screen saver is off when the screen is off, but the PC is not asleep, so password on wake does not fire, nor does password on resume from screen saver. You could set a sleep timer as well, which would fire a password on wake, or simply use a blank screen as your screen saver, thus you get the screen "off" effect as well as a password. Open Settings, and click/tap on the Accounts icon. Note: This option will only be available if the account has a password. Not the answer you're looking for? Browse other questions tagged windows-10 passwords sleep energy-saving or ask your own question. Why would a computer reboot when sending the screen to sleep/standby?